The Vice President of India, Shri M. Venkaiah Naidu has said that the ambitious, transformative vision that is making India one of the most favourite investment destinations in the word. He was addressing the India-Malta Business Forum in the presence of the President of Malta, Ms. Marie-Louise Coleiro Preca, organized by the Malta Chamber of Commerce and the Confederation of Indian Industry, at Valletta, Malta today. The Minister of State for Finance, Shri Shiv Pratap Shukla and other dignitaries were present on the occasion. The Vice President said that Indian economy is growing at around 8%, currently is one of the fastest growing major economies of the world. He further said that growth and development are vital to implement social reform and Government is taking all the measures to bring in change, transformation in every sense is the motto of this government. The Vice President said that India is committed to build a five trillion-dollar economy by 2025, making India the 3rd largest consumer market in the world. He further said that India has climbed 30 places in the World Bank Ease of Doing Business Index this year and IMF has forecast that India will grow at more than 7 percent in 2018 and 2019, ahead of other major economies. The Vice President said that a number of economic reforms have been undertaken by Indian Government including digitization of the economy, financial inclusion, tax reforms like Goods and Services Tax (GST). He further said that more than 326 million persons have opened bank accounts in the last four years making financial inclusion a reality. Tax base has been widened and tax compliance has increased, he added. "It gives me great pleasure to be with all of you along with Her Excellency President of Malta. Your presence here is an affirmation of your continued commitment to strengthening our bilateral ties. After the fruitful discussions with Her Excellency the President of Malta, today morning, I am convinced that the economic relationship between Malta and India can move on to a much higher trajectory. I convey my compliments to the Malta Chamber of Commerce and the Confederation of Indian Industry for their efforts in organising this interaction. I am happy to share with you the ambitious, transformative vision that is making India one of the most favourite investment destinations in the word. Indian economy, growing at around 8%, currently is one of the fastest growing major economies of the world. Over the past half a decade, India has witnessed a positive swing in stock market indices, foreign exchange reserves and public investment in infrastructure. We in India, are committed to build a five trillion-dollar economy by 2025, making India the 3rd largest consumer market in the world. India has climbed 30 places in the World Bank Ease of Doing Business Index this year and IMF has forecast that India will grow at more than 7 percent in 2018 and 2019, ahead of other major economies. A number of economic reforms have been undertaken by Indian Government including digitisation of the economy, financial inclusion, tax reforms like Goods and Services Tax (GST). More than 326 million persons have opened bank accounts in the last four years making financial inclusion a reality. Tax base has been widened and tax compliance has increased. We have seen a strong global confidence in the India story with a surge in Foreign Direct Investments which reached over US $ 62 billion in 2017-18. We have a TRIPS compliant IPR regime and our multi-party democracy ensures essential stability and predictability. India and Malta have had trade ties for over a century. We now need to take this to the next level. Malta is a freight trans-shipment point, financial centre, and ICT and R&D hub. The business houses in India would do well to consider new and emerging opportunities. At the same time, Maltese companies could consider investing in India in health, maritime transport, films, pharmaceutical, travel and tourism sectors. I hope entrepreneurs in both countries will create a new dynamic that will propel our countries’ economies to grow at a pace much faster than today. We appreciate the recent visit by the Maltese Foreign Minister, Mr.Carmelo Abela to India, to participate in the India-Europe 29 Business Forum, leading a large business delegation to explore trade potential in different sectors. I do hope the India-Malta Business Forum will set the pace for a new era of enhanced, mutually enriching business environment. 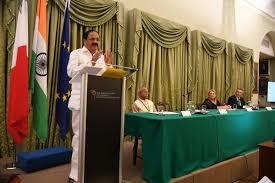 India, let me assure you, will most warmly welcome your collaboration, participation and contribution. I am sure Malta, under the able leadership of Her Excellency, Marie-Louise Coleiro Preca will further enhance our trade relationship in the coming years.